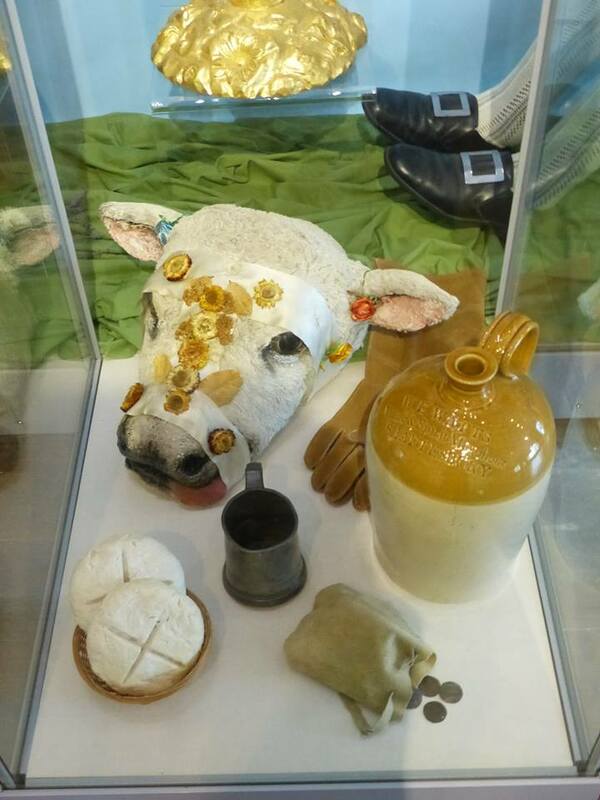 In Shaftesbury museum is a curious relic from a lost bygone custom. The structure an ornate shaft was called the byzant and a curious ceremony which maintained ancient rights for the town. 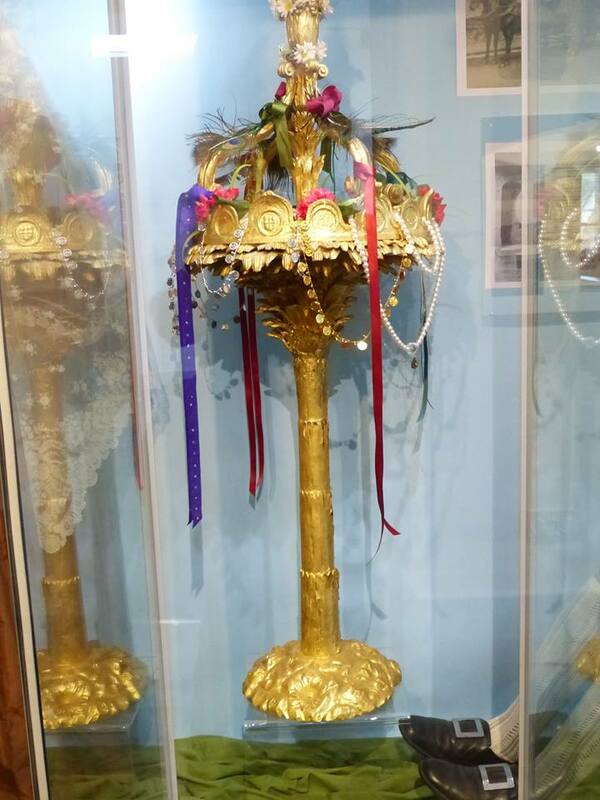 The custom being at first on Holy Cross Day, the first Sunday after the 3rd of May, being in 1622 transferred to the Monday before Holy Thursday, or Ascension Day. Many people visit Shaftesbury for its picturesque hill top setting, especially taking in the famed Gold Hill, but this location caused problems for the town as it did not have a reliable water supply. Yet, at some point someone in the settlement came to an idea at nearby Enmore Green at Motcombe was a water supply which could be utilised. Despite the futile nature of the ceremony the village of Motcombe could still refuse access if it did not happen. After the ceremony the attendees would make their way back, rather tiringly up the hill to Shaftesbury. 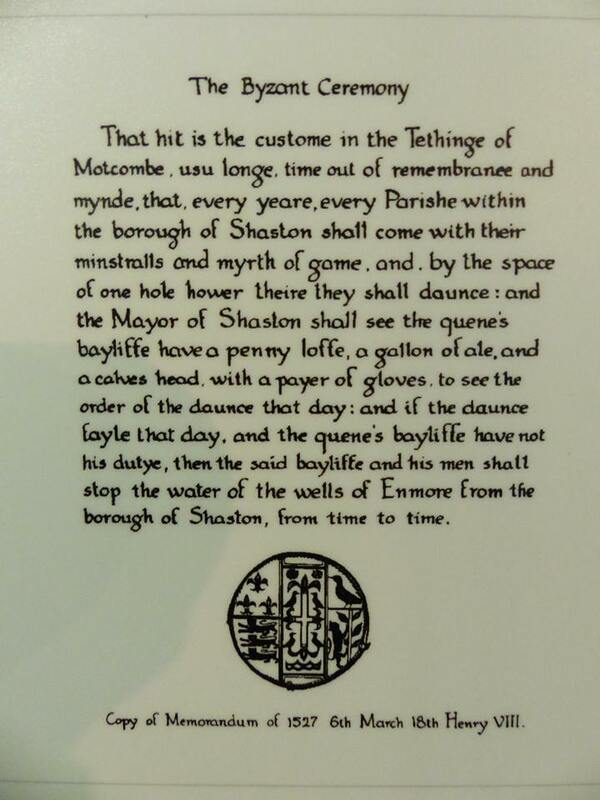 The protestations fell on fallow ground and now the only remembrance ended up in Shaftesbury museum. Thanks to Claire Heron for the photos! 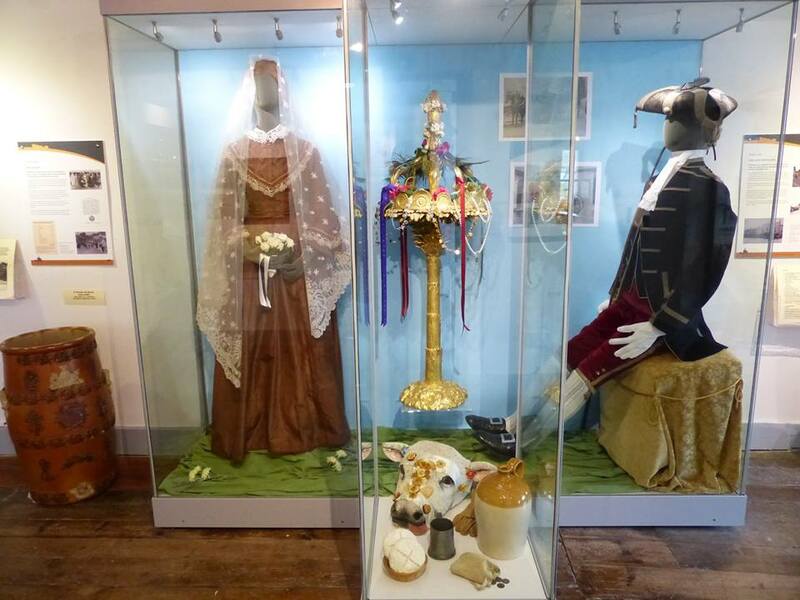 The ceremony dates back to a indiscretion undertaken by Sir Robert Knollys who in the 14th century owned a property on Seething Lane. I say he, it was really his wife Lady Constance (make of that what you wish) for he was off fighting the French alongside John of Gaunt! Legend tells that she was so annoyed by chaff dust blowing from the threshing ground nearby that she bought that property turning it into a rose garden which was okay..Planning permissions were fine for this. However, she also built a bridge to avoid the mud. This was more of a problem! This is not the only rose rent. The ceremony is part of what is called a quit rent, a token rent, established to recognise still the ownership of the property but given as a gift. Other examples exist in the county, but I will focus on these rose rents. The date of course, is significant above, it was a quarter day, when rents were paid on this date, therefore it is not usual to find that quit rents were paid, in particular the giving of a rose. A number of rose rents existed of which this is the last true survivor perhaps. Surely after so many years the penalty would have paid. 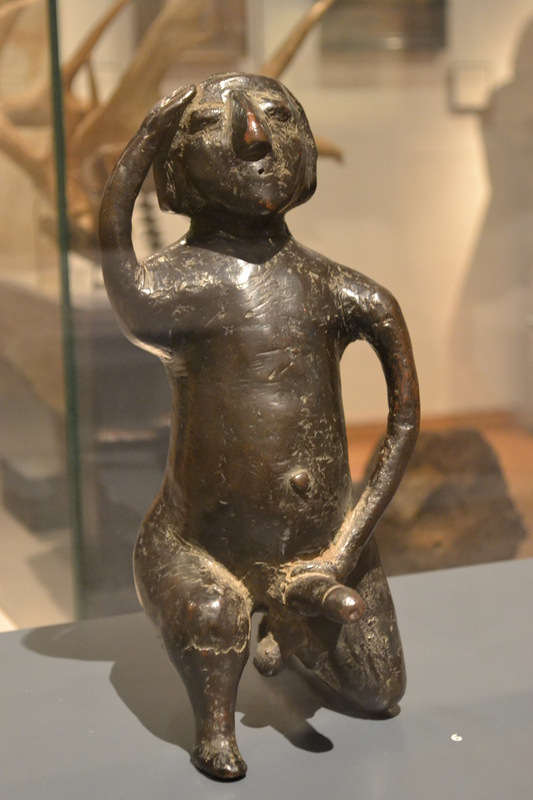 It appeared to have ceased in 1666, doubtlessly after it was burnt down in the great fire. Yet despite the rose rent being paid already for nearly 300 years and doubtlessly paid in full, it was revived in 1924 by the noted vicar of All Hallows by the Tower, Tubby Clayton. Why is not clear perhaps he was proud of the flowers in the garden. The ceremony is enacted around midsummer and after finding out from the church I decided to witness this ceremony in the 1990s. 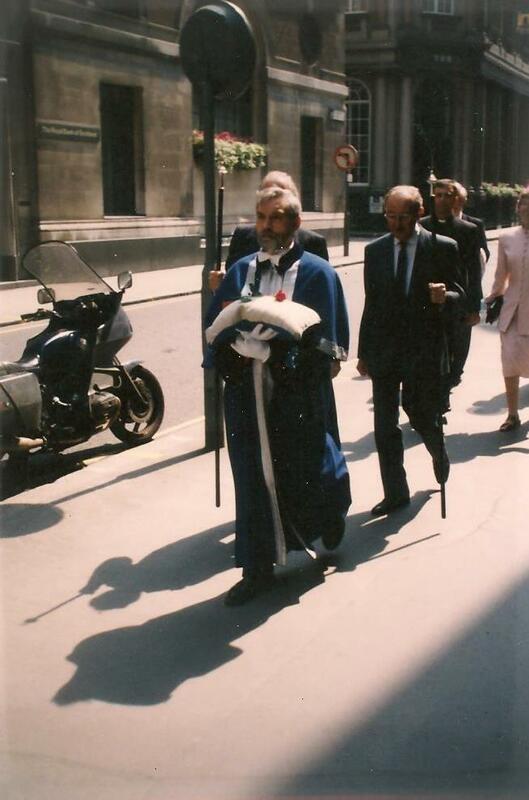 I waited around 10 o’clock in the garden and soon a small procession appeared of vicar, verger, parishioners, Knollys descendents and members of Company of Watermen and Lightermen of the River Thames, the later who organise it. The procession consisted of cushion bearer and a number of individuals dressed in the finest ceremonial robes. The cushion being an altar cushion from the church. 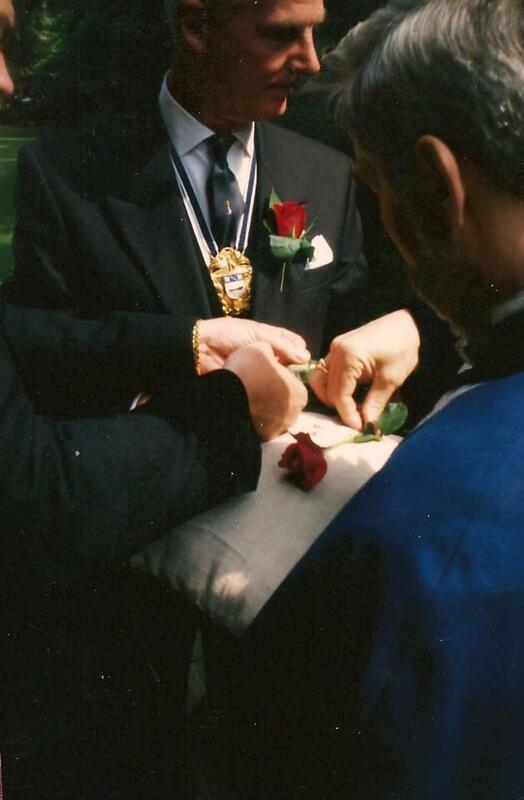 I was pleased to see the picking of the rose was not taken too lightly: a number of roses were inspected carefully. Too much greenfly. Too many uneven petals. Too few petals…just right. The perfect red rose was selected, cut and then pinned to the cushion by the Master of the Watermen. 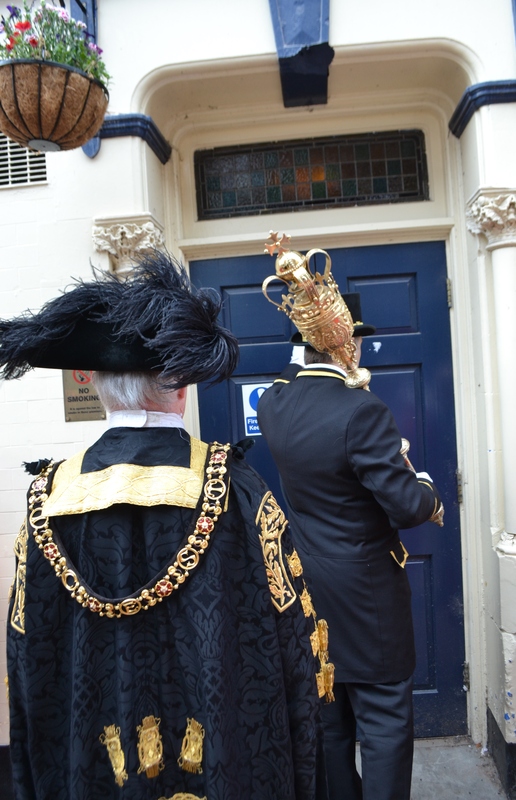 After getting the members of the procession together they then processed to the Mansion House. 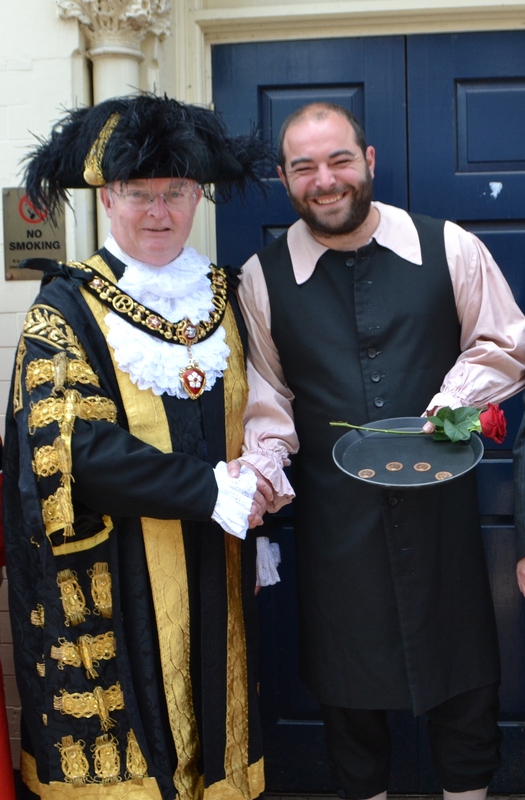 To give a rose to the Mayor this already belonged to the city! 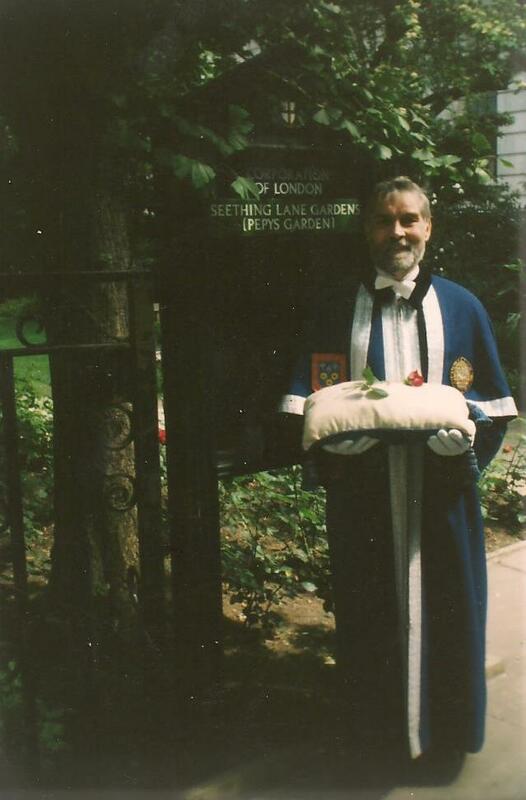 I am always amused how such strange ceremonies rarely affect London residents and very few individuals battered an eyelid as a man carried a rose on a cushion accompanied with ceremonially robbed attendants. We soon arrived at the mansion house, where to my surprise I easily slipped in to witness the final part of the ceremony. Sadly my flash wasn’t working, but I did get some video. Here waiting for the rose were the winners of the Doggett Coat and Badge (a ceremony I have yet to record!) in their fine red uniforms guarding the Lord Mayor. 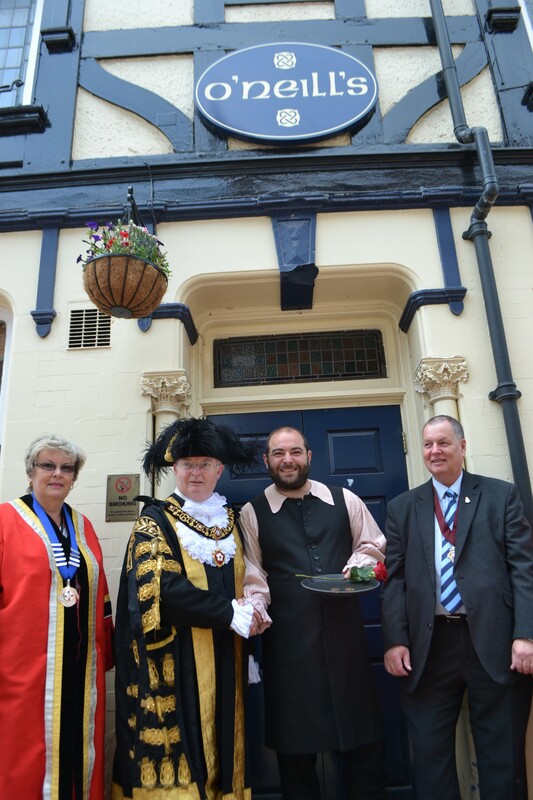 The rose was dutifully handed over and gratefully received by the Mayor. And that was it…except I think there was a lunch afterwards. I didn’t manage to get invited to this?! 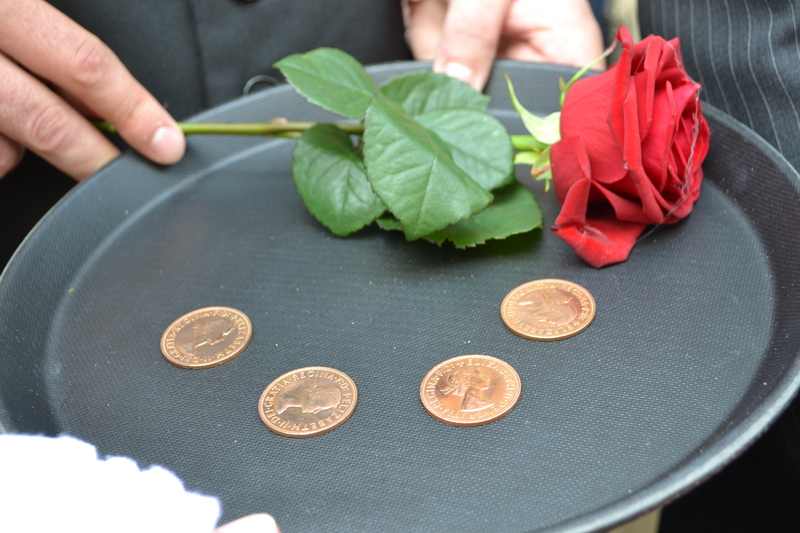 The ceremony of Knollys rose is one of those customs which typifies the eccentric British: colourful, solemn and completely pointless. And all the best for that!